I'm currently in Cannes, France, where I'm staying in the apartment building Les pins d'Alep. This kitty greets me every evening when I come home from the film festival. Be sure to visit him too if you're here. P.S. 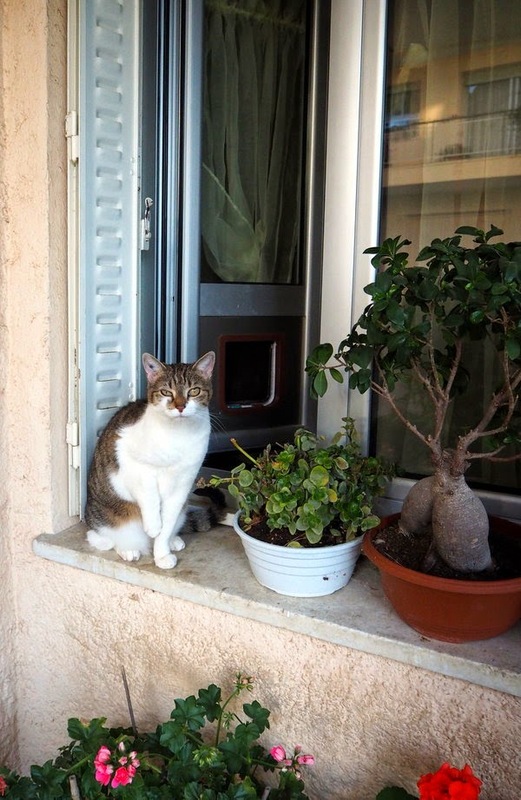 Have you seen this mime with cats from Cannes? I wonder if this kitty is in town for the film festival? Congrats on your book! dood !!! ya look enuff like me ta bee me brother....iz yur last name o cat by any chance ore due ewe reel lee love .... butter ?? ☺☺☺ !!! That is one good looking greeter! Lovely sweet faced kitten in the window. Hope she does not eat from that poisonous plant to the right, the Adenium obesum Desert Rose. Cute kitty giving you the wink with its right eye? Have a good time at the film festival! Wow! YEARS ago Maybe 2012? 2013? I did a post about Kitty City at Christmas time and I photographed some kitties there...this cat looks sooooooo much like one of the kitties! What an adorable cat! Aw he is a beauty too! In the last photo, Kitty is thinking: "Really? No flats on the red carpet? Oh, puh-LEEZE!" This kitty looks so sweet. I notice she is lifting her front paw, maybe she was de-clawed? Look at that little tree with the swollen trunk, it looks like maybe a Jade plant. I love the windowsill. I bet you are there for the opening of a screenplay you did? It's nice to be greeted by kitties in the morning! Congratulations for your new book! I look forward to buying it when I will be back to France. Have fun at the film festival! Did you see any celebrities? You're now one...with that book. Congrats! What a sweetie! Hope you have a wonderful time. How fun to get to go to the film festival! Enjoy! And congrats on your book. That's so exciting! Lovely cats. Cannes I hope they are spoiled. Adorable kitty! Congrats on your book! Thank you for linking up and sharing this post. Have a happy weekend! Wishing you great success with your book! Love your Kitty greeting. Congrats on book. Have a lovely weekend. Oh un Cannois ... c'est mieux qu'une Cannoise... Heu, il faut être du coin pour comprendre. J'espère que tu auras bien profité du festival. What lovely photos. 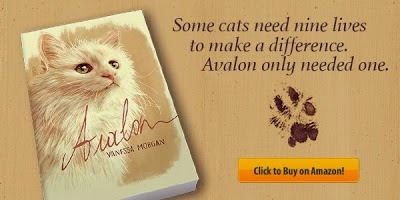 Congratulations on your new book on Avalon coming out soon, we are really happy for you! He seems to be winking! How cute. The second picture is priceless. That face and pose says so much. I love the expression in the second photo. Hope you are having a great time in Cannes! Thanks for linking up over at Toronto Teacher Mom! The expression in the second photo is priceless! What a gorgeous neighbor. He's your bon jour kittie! Thanks for joining us on Oh My Heartsie Girl Wordless Wednesday!